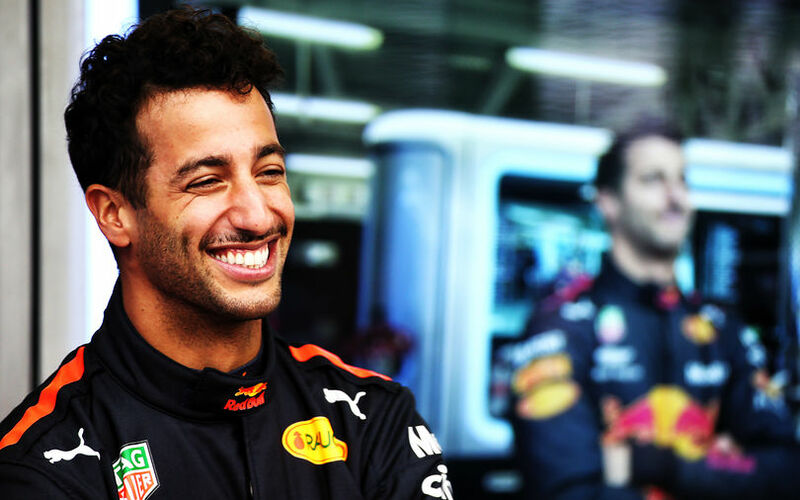 Daniel Ricciardo had never been the fastest in any of the sessions this weekend, but when it mattered, the Australian put in the best lap of everyone and took pole. With the broadest of smiles, he topped Red Bull team mate Verstappen to secure a Red Bull front row for Sunday's Mexican Grand Prix. Lewis Hamilton was third fastest, ahead of championship rival Vettel. Qualifying kicked off with teams looking at one another to see how they'd use their tyres. Both Mercedes were out on track early, surprisingly on ultra softs, whereas all others opted to run Q1 with the softest, hyper soft compound. Halfway into the session, Vettel and Raikkonen had taken over the top of the timing sheet at a time when both Red Bulls were still waiting in their garages to get out. When they eventually did get out, the pace was there immediately. Vestappen set a 1:15.756 on his attempt, 0.110s quicker than Ricciardo, and a solid 3 tenths ahead of Vettel. That was it for Red Bull, as well as for Ferrari as they were certain of progressing. Both Mercedes did return to the track on hypersoft tyres, resulting in Bottas going fastest, 0.093s faster than Hamilton, and 0.176s ahead of Verstappen. Further back, Alonso saw his first time disallowed due to exceeding track limits. Replays showed how the Spaniard oversteered on the previous kerbstone, and hence was unable to make the corner properly. His 17th time - a tenth off of Vandoorne - was therefore scrapped. Nearly all those that ran again improved quite a bit, with Alonso the first out on track, shooting up to 7th. However, with everybody else improving as well, Alonso ended up 14th in the end, enough at least to break his 3-race series of Q1 elimination. Leclerc was the only one slower than Alonso to make it through into Q2, leaving Vandoorne, both Haas and both Williams behind. Q2 saw all top 6 drivers go out on ultra soft tyres while Force India went for an even more surprising tyre choice, using the super softs - the hardest compound available - on their first laps. Unsurprisingly, they ended up nearly 2 seconds off the pace setter. That pacesetter turned out to be Verstappen in Q2, edging out Hamilton by just 0.004s, and Vettel by 0.075s. Ricciardo and Bottas were at 2 tenths, Raikkonen at 3 tenths. The closing stages of Q2 saw the top 6 go out once again, this time on hyper soft. This tactic has become accustomed this season, with drivers setting strong sector times before just returning to the pits, leaving their best time on the board to be able to start the race with the harder compounds. The same was true this time around. Others did improve, with Sainz up to 8th, ahead of Leclerc and Ericsson. Ocon ended up 11th by using ultra soft tyres, faster than Alonso on hyper soft. Perez was 13th fastest on ultra soft and Hartley 14th after a mistake on his lap that may have come him several positions on the grid. Pierre Gasly didn't set a time in Q2, aware that he'd be started from the back anyway thanks to power unit change penalties for the second race in a row. In Q3, Raikkonen was first out on track, ahead of Vettel, Hamilton, Bottas and Sainz. Ricciardo and Verstappen were last out on track, hence last to complete their first laps. Those first hot laps resulted in Verstappen bettering the rest, with Vettel, Hamilton and Ricciardo closely behind. Bottas ended up 5th fastest, ahead of Raikkonen, Leclerc, both Renaults and Ericsson - the latter notably 7 tenths slower than his team mate. On the second run, Ferrari were once again the first to start their flying laps, but this time, Hamilton chose to go last, behind Verstappen. As Vettel, Raikkonen and Bottas failed to improve on their earlier laps, the others had all to play for. Ricciardo surprised everyone and shot to the top of the timing sheet. Verstappen did improve on his earlier time, but stranded in second. The Dutchman was left to rue "engine braking and rear locking, same issues as in FP2", leaving him frustrated to miss out on this chance to become F1's youngest pole sitter. Lewis Hamilton secured himself of third on the grid, positioning himself perfectly to take his 5th world title tomorrow.